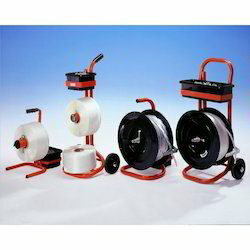 Our product range includes a wide range of lashing belt cord strap dispenser. Our rich industrial experience supports us in offering a wide range of Lashing Belt Cord Strap Dispenser. Offered belt cord strap is developed from the top quality material & latest technology in fulfillment with the standards of the industry. This belt cord strap is tested in terms of quality so as to dispatch a defect free range. The offered belt cord strap is provided in various specifications as per the requirements of customers. Replaces conventional cargo restraint products such as heavy duty steel strapping, wire (rope), chains and ratchet straps. Cordlash woven polyester lashings greatly reduce or even eliminate the need for wood blocking & bracing. Cordlash (woven) lashings are most commonly used for direct securing in/on ships, flatracks and railcar. Looking for Lashing Belt Cord Strap Dispenser ?